Pro Taper has come up with a product so amazing, so revolutionary that there isn’t even a name for it. For centuries people have been trying to figure out how to hold their bikes into one spot in their respective modes of transportation. Cavemen used vines and locks of hair to strap their bikes to the backs of mastadons. Now, after years of struggle, Pro Taper is proud to introduce the Tie Down. You’re welcome, world. You’re welcome. 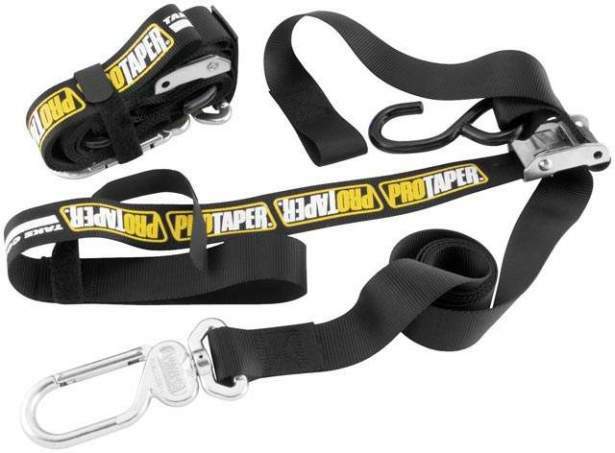 The revolutionary Pro Taper Tie-Down incorporates a spring loaded, swivel carabineer base hook that will prevent your straps from ever getting twisted or coming un-hooked in hard to reach places. We have also incorporated soft hook straps and velcro loops to keep the loose ends secure. This tie-down is far from your traditional straps and has received rave reviews since being introduced.